In an earlier recollection, "Weequahic Park as a Sports Site", I talked about the various sporting events I had covered for the Ledger/Star-Ledger, including boat races on Weequahic Park Lake. The event was the New Jersey Canoe Regatta, held Saturday, June 13, 1938. Participants included area boat club racing teams including several from New York City. As I would be covering the event for the Newark Ledger (It didn't become the Star-Ledger until 1939), I telegraphed a Press Query to The New York Times from the Ledger offices at 80 Bank Street on the day before the races and asked them if they wanted coverage of the New York teams entered in the races the following morning. NAT G BODIAN, HOLD FOR ARRIVAL SODA FOUNTAIN IN BOATHOUSE WEEQUAHIC PARK. 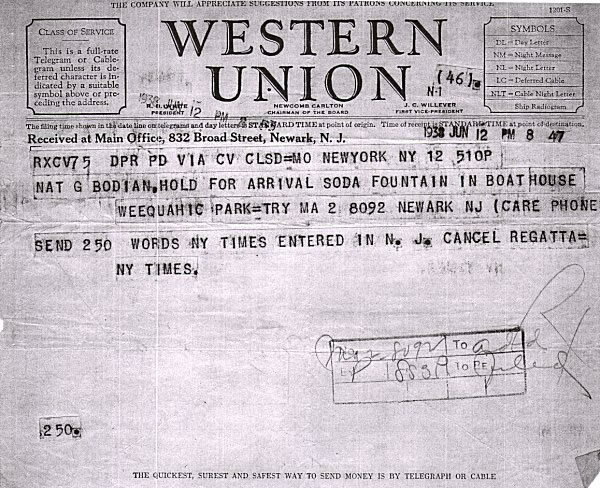 I retrieved the telegram early Saturday morning when I arrived at the boathouse, which was also the headquarters for the boating event and filed my Times story through the Western Union telegraph operator based at the Ledger, after I had first written my story for the Ledger. I still have that Boathouse telegram.